I was looking at some old rocks and found this one with kind of a gray bubble surface on top and was just wondering what it might be. It's kind of hard to make it out so I'm posting some other rock with kind of the same bubble appearance in quartz I guess. That growth style is known as "botryoidal" The pinkish one, to my untrained eye might be smithsonite (ZnCO3). Might want to look into hematite and malachite as well, which commonly form this structure. Where dit it come from? I'm fairly certain it's (first photo) not hematite or malachite. My best guess is botryoidal <a href="http://en.wikipedia.org/wiki/Fluorapatite" target="_blank">fluorapatite</a> <img src="../scipics/_wiki.png" /> (New York?). It's difficult to identify any rock or mineral from photos alone. botryoidal. The rocks were some old mildly curious "outdoor" rocks my Dad had collected. He had about a wheel barrel full of them. They may have come from Oregon, we used to live there. I once visited the Smithsonian and looked at all of the mineral collection. Neat stuff those rocks. Universities too have some good displays. 004.JPG looks very similar to poor quality common milky opal, Although I'm not a mineralogist and am unsure why in one rock some quartz would be so hydrated compared to the substrate. Also has some similarity in appearance to Chalcedony except that would be unusual to be with typical quartz. No my mind keeps going back to maybe an opal that had near zero trace impurities to add color when it was forming. <strong>IrC</strong>, I agree that the second specimen does look a lot like <a href="http://en.wikipedia.org/wiki/Chalcedony" target="_blank">chalcedony</a> <img src="../scipics/_wiki.png" />. In fact, after finishing my previous reply, I went through my mineral cabinet drawers, and found a similar looking specimen of fluorescent chalcedony with calcite. 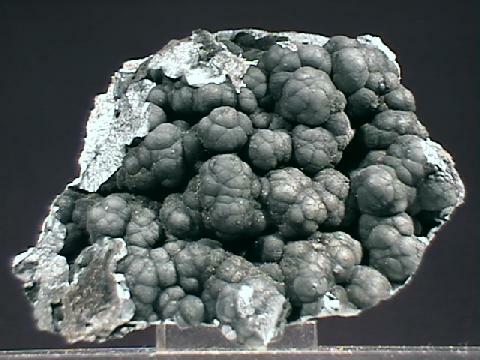 I also found a specimen of botryoidal <a href="http://en.wikipedia.org/wiki/Hematite" target="_blank">hematite</a> <img src="../scipics/_wiki.png" /> that looks similar to the rock in the first photo&mdash;leading me to retract my first statement. I'll try to take some photos of my specimens tomorrow morning; if for no other purpose than aesthetic gratification. For the hell of it, I'll try to take some <a href="viewthread.php?tid=28664#photos">fluorescence/phosphorescence photos</a> tonight. My father is a geologist and has a large collection of rare rocks, can anyone guess what these are? Yes, the first one is orange gypsum, found in North Africa. That one was the easiest though, the last one is not rhodonite. Then fluorite perhaps? I once found some fluorite that looks similar. Morgan, try a streak test on your unknown botryoidal mineral. All you need is a piece of unglazed porcelain&mdash;sometimes the back of a tile is suitable. If the <a href="http://flic.kr/p/jCquG6" target="_blank">streak is brick red</a> <img src="../scipics/_ext.png" />, it's likely hematite. Guys how do you identify rocks? Is there some kind of protocol for that? I never understood how one could do it so easily if there are so many similar ones and each rock actually looks even more similar to my untrained eye. On the topic of botryoidal formations, here are a couple from my collection. Alright, the pictures were a bit blurry so I'll just tell you what the rocks were. -Tremolite, manganese gives it its color. -Dolomite Crystal, these have rare curved faces. -Fuchsite, a chromium rich green mica, the pink is quarts. From my limited training there is more to it than just looking at the rock. For example, look at the wiki article on zircon. Look at all the information listed under identification. Streak test is pretty common (mentioned above) but when you are out in the field you use what is obvious (color, crystal structure) to narrow it down then you start to examine other features such as cleavage, hardness, etc. to peg it to a specific mineral. I don't think there is any sort of master chart with all the different rocks/minerals on it where you can start from the top and work your way down. Afterall, there are soooooo many minerals out there, some only found in one or two places in the world or only found once for a single sample. It's interesting but it's a huge field in itself. Then again I am sure a lot of geologist nowadays just send out the rock for elemental analysis though they might have a general idea of what it is beforehand. As of 10/2013, there were 4859 <a href="http://www.ima-mineralogy.org/" target="_blank">International Mineralogical Association (IMA)</a> <img src="../scipics/_ext.png" /> listed mineral species. This isn't for identification, but it's a 'master chart'. This rock looks like it fractured, shifted, and then cemented itself back together. I don't know what formed it that way or what it's called. Or maybe it grew and crowded into this arrangement? This is some crumbly rock I have no idea about. More of my inherited outdoor rocks, I made a sharp flat shard in a shiny solid black obsidian that fits in the palm of my hand. The very thin cutting edge is translucent brown if held up to the light while the rest opaque glassy black. I just took a hunk and hit it with a hammer. It's neat how you can fit the strange smooth surfaces back together if you split one in half. I like these other obsidian pieces better though, the few pinkish speckles here and there might be pretty if the piece were split open. The other kind of reminds me of a wood grain. I find the shapes of rocks almost as interesting as what they are made of sometimes. Now that you mention it, it does look like it could be some man-made paint or plastic bits that were cemented with sediments. There's also some yellow-green algae growing on it too. Some kind of green rock. I don't know what it is. Some curvy things. They're quite heavy. You can see a porousness to them. Kind of a clay sandstone material? I'm not sure what to call this. It appears to be a fine clay-like layering but hard now with a slight ring to it if you tap the thin pieces. I wonder where this stuff comes from? You see it all over as round polished gift shop stuff. Still it's kind of nice. I would like to explore the Burgess Shale Formation I think. Looks like petrified wood. They're very heavy. More of my outdoor rocks, a hodgepodge of commoners I suppose. The tiger eye dabbed with a little water for picture day. I don't know the names of the picture 48 group or what they may be. This is a simple little rock or mineral but not much in the way of clues other than if you wet it, you can sort of see into it somewhat, or not opaque if you polished it. But it's a very dark green, that's about it. It would be glassy if polished, no grains in it. Jade? More aventurine? Green quartz? Morgan, I think the one that looks like it has been fractured or shifted is dolomite, is has slightly rounded crystal faces. Could the one with orange stripes be banded iron? Here is the Wikipedia on dolomite. An easy way to test for it is simply to drop some dilute HCl on it, if no gas is evolved it could be dolomite. Mtorolite? It's a type of chalcedony; yours seems too dark though. Actually, now that I think of it, your previous green mineral might be mtorolite. The furthest right in the group of three rocks you showed looks like some sort of chalcedony as well. I wonder what causes this crinkle effect, as if the surfaces were melted and pressed against something? A smooth rock of some sort. The camera didn't capture the sheen this slate-like rock had. It also had more of a green tint. I couldn't get the angle right in the sunlight. Looks like a <a href="http://en.wikipedia.org/wiki/Garnet" target="_blank"">garnet</a> <img src="../scipics/_wiki.png" /> <a href="http://en.wikipedia.org/wiki/Phyllite" target="_blank">phyllite</a> <img src="../scipics/_wiki.png" />. Can you post a photo taken through a magnifier of one of the garnets? I was thinking it was garnet too remembering another rock I have and a previous post of yours of a rock face loaded with them. Funny I didn't notice the flecks until I saw my own photo of them, but that characteristic stands out once you are used to seeing it. I can photograph it using my magnifying lens yes, I can't tell you how many times I wished I had a macro lens. Here is a cool metamorphic rock studded with garnet porphyroblasts that I found up at my cottage during the summer. I'm not exactly sure whether the host rock would be classed as a gneiss or a granulite, although I think that it seems more like a granulite. Here are a few really cool features that I found up at my friend's place near Parry Sound during the summer. The first image is of a highly metamorphosed, folded, mafic dike (amphibolite) that cuts through some sort of felsic granulite. Left one might be Amber? If so that's a nice big natural chunk of it! I think Oregon is a good bet for the source of most of these. I had a friend that carted home an essentially identical collection to yours while hiking around south-central WA. I helped him clean & organize them later. 3: Add foil strips to HCl bath. Observe vigorous redox rxn. I too thought it might be <a href="https://en.wikipedia.org/wiki/Amber" target="_blank">amber</a> <img src="../scipics/_wiki.png" />, but I don't know what rough amber looks like&mdash;I've never seen it myself. blargish, great outcrop photos. Thanks for sharing. I was thinking it was garnet too remembering another rock I have and a previous post of yours of a rock face loaded with them. Morgan, I don't recall ever posting such a photo (before this thread). Any chance you could link to it? I just started looking at these. The first were the mineral fluorite... good examples too... typical colors are white, violet-purple and green. The purple kind is easily confused with amethyst until you scratch it. The curvy looking things are castings.. desert environment. I'll read up on the gensis and get back to you. bfessor I must have spaced out thinking you posted some previous garnet pictures. The amber looking rock is too heavy to be amber but the crinkle effect and color does look like it. I was looking at/enlarging the photo of the big, smooth, slate blue rock again and the curved lines around the ends almost make it look like a petrified wood. Some other rocks, last of the pile. And so concludes this collection of misfit rocks, rocks that weren't showy enough to be indoors. Individually each one didn't have much appeal to me, but now that I look at them collectively, they do. Thanks again to all for all the interesting comments. Again, the first one looks like chalcedony. The ones in the sixth photo appear to be river-worn granite <a href="https://en.wikipedia.org/wiki/Particle_size_(grain_size)" target="_blank">cobbles and pebbles</a> <img src="../scipics/_wiki.png" />. Are strong magnets attracted to any of the others? In the second picture, those big shiny plates look like muscovite. Is that some sort of muscovite schist? It could be muscovite, I'm not one to ask as I know very little. I could say it looks like mica and that's about it. bfessor some time ago I put some little square neodymium magnets on the rocks to test them and I was surprised how many at least stuck well enough to hold on without falling off. That one on the end in the last post I made is of course highly attracted to a magnet. By all means feel free to kept the thread going. I wish I could find new rocks but living along the gulf coast there's a lot of sand and clay. I was watch PBS though and not too far from here they mined a small area for a bit of iron ore containing rocks. When I lived here long ago as a boy there were these cliffs that had really pretty colored clays, I remember digging out muddy purples, yellow, and red all right next to each to each other, like melted plastic. It was soft and malleable. I also liked finding the lighter pumice rocks on the railroad tracks, we'd put them in the water to see which ones float. Here's some ringing rocks you might be able to whittle a unique tuning fork out of. I like the sound sand can make. There're several good booming sand clips. The amber looking rock is too heavy to be amber but the crinkle effect and color does look like it. My first thought was mica or vermiculite for the flaky stuff too. It does look pretty identical to muscovite I've seen before but the placement/occurence of it in that speciment are way more consistent with mica I've seen (in my very limited experience). I'm glad you expanded the thread bfesser! Now I have excuse to dig out all sorts of goodies! I've got a few Aquamarines with cool looking muscovite all over them that would pertain to this particular discussion. Those will be first, & then maybe a ton of natural pyrite samples I've got in a cigar box somewhere a bit later. I always thought that muscovite was a type of mica? I look forward to seeing the pics of your aquamarines! Yeah I suppose you're right...I guess I've always thought of 'mica' as being sort of a loosely defined term for any rocks/minerals that behave like, well, the other 'micas'. - Phengite with Mg or Fe2+ substituting for Al in the Y site and a corresponding increase in Si in the Z site. Regarding the aquamarines, I just realized that I no longer have a real/quality camera here. Gonna have to choose between just a couple megapixels from my phone or couple megapixels from my kindle...No big deal though should still be able to see some acceptable level of detail..
Pathos I will fiddle with the amber colored rock and take another photo this weekend. What about that dirty white crinkled rock I posted, would a white tree sap mineralize or if anyone has a guess? I came across these amber tidbits if anyone can add to it or point out any flaws. I'll post some other kinds of old rocks I found, some that I forgot about, mostly ones that I was seeing if magnets would stick to them. Morgan, <a href="files.php?pid=317177&aid=29199">this one</a> looks like it could be chalcedony. Rather than continuing to post photos and go by visual evidence alone, perhaps you should look into learning more about <a href="https://en.wikipedia.org/wiki/List_of_mineral_tests" target="_blank">mineral properties and identification tests</a> <img src="../scipics/_wiki.png" />&mdash;it would help to make this a more scientific and valuable thread. Could the one with orange stripes be banded iron? It's unclear which <a href="viewthread.php?tid=28664&page=2#pid316792">rocks you're referring to</a>; regardless, neither of them are <a href="https://en.wikipedia.org/wiki/Banded_iron_formation" target="_blank">banded iron formation</a> <img src="../scipics/_wiki.png" />. I've collected two specimens of banded iron formation from two different locations in MN (see photos below). Morgan's specimens look more like <a href="viewthread.php?tid=25943#pid297416">iron-stained sandstone</a>, to me. I tried taking photos of some of my mica schist specimens a few days ago, but my camera battery died before I got up to the good specimens from the <a href="http://www.mindat.org/loc-22519.html" target="_blank">Black Hills, SD</a> <img src="../scipics/_ext.png" />. I just started looking at these. The first were the mineral fluorite... good examples too... typical colors are white, violet-purple and green. The purple kind is easily confused with amethyst until you scratch it. I agree that they're a bit tricky to distinguish by appearance. A simple scratch test would allow <a href="https://en.wikipedia.org/wiki/Mohs_scale_of_mineral_hardness" target="_blank">relative hardness</a> <img src="../scipics/_wiki.png" /> of <a href="viewthread.php?tid=28664&page=2#pid316786">these specimens</a> to be determined. <a href="http://www.mindat.org/min-1576.html" target="_blank">Fluorite</a> <img src="../scipics/_ext.png" /> has a hardness of 4, while <a href="http://www.mindat.org/min-3337.html" target="_blank">quartz</a> <img src="../scipics/_ext.png" /> has a hardness of 7. Failing to scratch plate glass (5.5) would rule out quartz. Coolio. Try to get a shot of each tip or corner if possible! We found a bunch of those white-crinkled rocks too in our searches, & my friend kept a few of the cooler ones, but I can't remember if we ever determined what it was or not(much less what the name was if we did). I might be able to track him down and grab a piece for analysis though. That's a very helpful Amber site! Their specimens are supeeerrr cleaned up - no doubt ball-milled & polished too - but trust me every natural piece I've seen looks almost exactly like yours. Regardless a real test is the only way to know. The Density and Acetone tests would be a breeze to do, and then you'd know for sure. bfesser: WOW nice pics of some very nice specimens! Those sheets of muscovite are veerrry neat indeed. I couldn't zoom all the way in on the Almandine Mica Schist pics, but the general appearance reminds me of a few chunks I collected because they had what looked like a black pyrite all over them. Is that how you would describe it? I'll post some pics of what I'm talking about (along with the aquamarines and some fluorites) when I get home very soon here. chemrox was right on the money though, the green and clear/cloudy white/purple ones are all fluorite. My buddy and I tested the theory back when we collected our samples, and they were identical to morgan's pics. REALLY wish I still had some pics of them! GRR! The amber colored crinkle rock is about as hard as quartz I would say and certainly not a 2-3. I heated an edge and it changed to a darker orange and a tiny flaky shard popped off. I hit the rock with the wire wheel side of my grinder and then the grinding stone side and it's hard. Still I don't have a name for it. bfesser here's that one rock I tried to magnify for you with meager results. With my eyes it seems like one or two flecks are red but the camera doesn't really show it. This rock is really glittery in strong sunlight and it leaves glitter on your fingers too. Still I don't have a name for it. 2nd specimen: I'm sticking by my tentative identification (phyllite). 3rd specimen: <a href="http://en.wikipedia.org/wiki/Biotite" target="_blank">Biotite</a> <img src="../scipics/_wiki.png" /> schist with garnet. Neodymium magnets will stick to this, better in some spots if I recall. It has a more glittery appearance and slightly greener if viewed directly instead of the camera. I was going to say agate but it would have been a guess. I vaguely remember some agates on the coast of Oregon, rocks along the seashore. I think I found the source of that piece of white crinkle rock but not the name. I was wondering what the green is? The "crinkle rock" above looks to be some sort of chalcedony (agate?) with a vug of quartz drusy. blargish I will see what I can do to figure out what that turquoise suspect is. Oddly, I thought the dirt on the crinkle rock kind of enhanced the quality of the crinkles. This one reminds me of fine clay sort of. How about some <a href="http://en.wikipedia.org/wiki/Structural_geology" target="_blank">Structural Geology</a> <img src="../scipics/_wiki.png" /> and <a href="http://en.wikipedia.org/wiki/Geomorphology" target="_blank">Geomorphology</a> <img src="../scipics/_wiki.png" />? I split some black obsidian . The pieces almost look like black tar, how smooth they are when fractured. I might try some colorful green fire flame test with the copper carbonate from one of those rocks bfesser, just to see what kind vividness I can get using methanol. Thanks for identifying the specimen. I remember reading somewhere, perhaps National Geographic or something about Russia and malachite, that the dust from working the works of art an occupational hazard, back when they were made. Here's a colorful corrosion effect. "The flame was actually green and I think its from the cooper because I did not add any boric acid." Here's a quartz-like rock which is slightly translucent on the outer surface that seems kind of geode or vug in nature. It's really heavy so probably not hollow. Maybe it would be more telling if it were cracked or sawed open. Ah, I see the orange one ended up being agate. The extra pics/angles were definitely helpful. Latest crinkly pics are rad - nice rock! Same goes for that biotite garnet schist specimen. Be careful with that one if its very soft because those garnets could just fall out & would be tragic to lose them. 4&5. Name that rock? Heh...I found these digging through my collection and can't remember for the life of me what they're called. Eventually I can ask the friend I got them from and he'll remember, but figured I'd post here first. Any guesses? Pathos, I have three questions for you regarding your photos. First&mdash;and I'm being serious, here&mdash;do you have any color-blindness? If not, and second; what type of camera are you using to take these photos? Finally, did you collect these specimens yourself or did you purchase them (implied: do you know the localities)? Perhaps it's just the photos, but I don't see as much as a tinge of blue-green in your 'aquamarine' specimens. If they were my own, I would label them as <a href="https://en.wikipedia.org/wiki/Beryl" target="_blank">beryl</a> <img src="../scipics/_wiki.png" /> with muscovite. They're absolutely beautiful, nonetheless&mdash;I particularly like the terminated specimen in the 5th&ndash;7th photos. The phantoms in the fluorite are likewise beautiful. I love your specimens. In your last post, the smokey quartz looks a bit like citrine. But these distinctions are more gemological than mineralogical, I think. As with the beryl, I'm not seeing the expected color in your photo of 'rose quartz.' How did you come to the identities of the specimens in the third photo&mdash;to me, they don't seem to match your description. As for the specimens for which you've forgotten the name, they're <a href="https://en.wikipedia.org/wiki/Vanadinite" target="_blank">vanadinite</a> <img src="../scipics/_wiki.png" />&mdash;and I'm 100% certain of it. They look to be quite sun-damaged, however. I'd recommend keep them in a dark dry place when you're not enjoying viewing them. I posted a <a href="viewthread.php?tid=14644&page=17#pid247603">bad photo of a vanadinite</a> specimen in my collection, a couple years ago. On the topic of beryl, here is an emerald vein in a biotite schist. Also, I have this bought specimen that is labeled Magnetite /w Matrix (which seems to be a schist or phyllite). However, the octahedral crystals show no response to any magnet and do not deflect a compass needle. I have always thought that magnetite was magnetic... Any thoughts? Some common rocks and ordinary unloved rocks with different patterns in them ... I like the one on the end of the top row for the tiny root-like features. You can see them better if you enlarge the photo. Bear with me, I've more. I was looking at your clear fluorite crystals Pathos and it reminded me of mine that I have in a box somewhere but they are purple. And I was wondering if it was iron or manganese or what that makes them purple? In the article below, very large cubic crystals occur. Are there any minerals that are a mix of calcium fluoride and other salts? I remember an old book on growing crystals where you could distort the crystals by adding other salts. "Fluorite comes in a wide range of colors and has subsequently been dubbed "the most colorful mineral in the world". The most common colors are purple, blue, green, yellow, or colorless. Less common are pink, red, white, brown, black, and nearly every shade in between. Color zoning or banding is commonly present. The color of the fluorite is determined by factors including impurities, exposure to radiation, and the size of the color centers." Coloration in minerals isn't always caused by the presence of transition metal ions. Colors can also arise from the optical effects (diffraction) of physical structures within the specimen (pseudochromatic) and a certain type of crystallographic defect called an <a href="https://en.wikipedia.org/wiki/F-Center" target="_blank">F-Center</a> <img src="../scipics/_wiki.png" />, which are created by naturally occurring ionizing radiation&mdash;as hinted at in your quote. Of course, man has taken advantage of this phenomena to produce artificially colored gems, which are sometimes misleadingly sold as natural specimens. On a related note; there has been a huge influx artificial 'mineral specimens' on the market which are originating from China and Poland&mdash;surely other countries, as well&mdash;at the moment, so just be mindful of this if you're purchasing specimens off eBay and the like. Some of the minerals are artificially colored by exposure to ionizing radiation, heat treatment, or similar means. Some of the specimens (CuSO<sub>4</sub> and Bi, in particular) are just lab grown fakes. And some specimens are even glued together from unrelated minerals. Some of the sellers advertise this plainly (e.g. <a href="http://www.ebay.com/itm/131104787298" target="_blank">"Chalcanthite - Lab Grown in Poland"</a> <img src="../scipics/_ext.png" /> , others hide the truth in fine print; some are ambiguous (e.g. <a href="http://www.ebay.com/itm/331120436704" target="_blank">"DINO: RAINBOW BISMUTH Crystal Mineral Specimen - 33 gr. Germany"</a> <img src="../scipics/_wiki.png" /> , and a few just lie outright. I was looking in a few boxes for my purple fluorite crystals and came across these rocks in boxes. The first one didn't photograph well, it's exceedingly glittery but not for the camera. It's a magic rock, completely jet black in indoor light. Some of those look really cool! The golden-rainbowish one in your first set of pictures looks like bornite or chalcopyrite (I'm not really sure how I can tell them apart in their massive forms). I have no clue what the first rock is in the second group of photos you posted. The group of lighter ones that follow seem to be turquoise, but I'm not so sure. My guess for the final blue rock in your second group of images is sodalite. I noticed the fake mineral link had some acanthite ore that was said to have been heated to form the "silver wires." It's funny how they look like some frost flowers, plants chilled to form ice ribbons. <strong>blargish</strong>, it could be a hematite <a href="http://en.wikipedia.org/wiki/Pseudomorph" target="_blank">pseudomorph</a> <img src="../scipics/_wiki.png" /> after <a href="http://en.wikipedia.org/wiki/Magnetite" target="_blank">magnetite</a> <img src="../scipics/_wiki.png" />; a red streak would confirm this. From <a href="viewthread.php?tid=28664&goto=search&pid=317757">this post</a>, 026.JPG is <a href="http://en.wikipedia.org/wiki/Quartz#Rose_quartz" target="_blank">rose quartz</a> <img src="../scipics/_wiki.png" />. 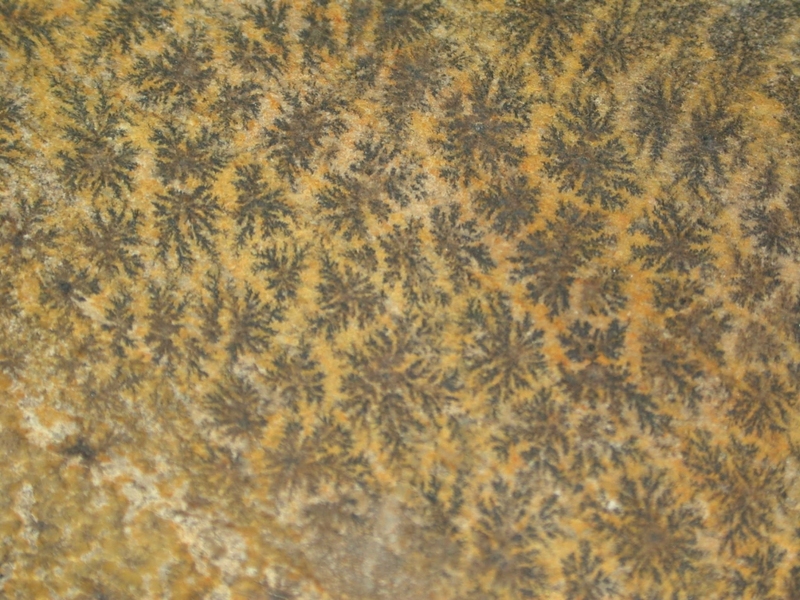 047.JPG, 049.JPG, and 051.JPG look to be shale with various iron staining and <a href="http://en.wikipedia.org/wiki/Dendrite_(crystal)" target="_blank">dendritic manganese</a> <img src="../scipics/_wiki.png" /> (clearly visible in the second photo). Apply a drop of 3 % H<sub>2</sub>O<sub>2</sub>(aq) to the dendrites to watch the effervescence as the Mn/Fe oxides catalytically decompose the peroxide, producing oxygen. From <a href="viewthread.php?tid=28664&goto=search&pid=317759">this post</a>, 098.JPG & 100.JPG look like <a href="http://www.blm.gov/wy/st/en/resources/public_room/gis/metadata/clinker-wy.html" target="_blank">clinker</a> <img src="../scipics/_ext.png" /> (metamorphic produced by naturally burning coal beds) or maybe <a href="http://en.wikipedia.org/wiki/Scoria" target="_blank">scoria</a> <img src="../scipics/_wiki.png" /> (volcanic). Many would erroneously guess <a href="http://en.wikipedia.org/wiki/Pumice" target="_blank">pumice</a> <img src="../scipics/_wiki.png" /> (volcanic). From <a href="viewthread.php?tid=28664&goto=search&pid=317761">this post</a>, 112.JPG & 117.JPG are a crystal formation called (colloquially) a <a href="http://en.wikipedia.org/wiki/Desert_rose_(crystal)" target="_blank">'desert rose'</a> <img src="../scipics/_wiki.png" />. It could be <a href="http://en.wikipedia.org/wiki/Gypsum" target="_blank">gypsum</a> <img src="../scipics/_wiki.png" /> or <a href="http://en.wikipedia.org/wiki/Baryte" target="_blank">baryte</a> <img src="../scipics/_wiki.png" />. From <a href="viewthread.php?tid=28664&goto=search&pid318286">this post</a>, 007.JPG, 008.JPG, and 010.JPG are very obviously fluorite. You should wrap the specimen in newspaper to protect it from further damage in the boxes. 013.JPG and 014.JPG are <a href="http://en.wikipedia.org/wiki/Chalcopyrite" target="_blank">chalcopyrite</a> <img src="../scipics/_wiki.png" />, possibly <a href="http://en.wikipedia.org/wiki/Bornite">bornite</a> <img src="../scipics/_wiki.png" />, as <strong>blargish</strong> suggested. Finally, from <a href="viewthread.php?tid=28664&goto=search&pid=318287">this post</a>, 024.JPG, 025.JPG, & 027.JPG look like <a href="http://en.wikipedia.org/wiki/Chrysocolla" target="_blank">chrysocolla</a> <img src="../scipics/_wiki.png" />, which is often mistaken for <a href="http://en.wikipedia.org/wiki/Turquoise" target="_blank">turquoise</a> <img src="../scipics/_wiki.png" />. 028.JPG & 031.JPG could be turquoise. 033.JPG and 037.JPG could be <a href="http://en.wikipedia.org/wiki/Pyrite" target="_blank">pyrite</a> <img src="../scipics/_wiki.png" /> with a bit of <a href="http://en.wikipedia.org/wiki/Limonite" target="_blank">limonite</a> <img src="../scipics/_wiki.png" /> on the surface, and quartz. 049.JPG and 050.jpg; <a href="http://en.wikipedia.org/wiki/Azurite" target="_blank">azurite</a> <img src="../scipics/_wiki.png" />, perhaps? Thanks for the identifications bfesser. The dendritic manganese in Wiki looks like a piece of artwork. I like that effect. The rock that looks like chrysocolla is such an odd color to me. And this angle shows another shade on one corner. The rock reminds me of clay that became metamorphic. I've a couple of larger fluorite crystal clusters somewhere, with full cubes all mingled together. It's the same kind of purple as the one posted and they're my favorite for the way they look. I like my ulexite rock too though. And as an aside, I like this little ring. The dendritic manganese in Wiki looks like a piece of artwork. I like that effect. These next two photos are from within the caves themselves, they aren't very big, and show the limestone bedding. Please excuse the blurry images! There is a noticeable absence of fossils in the limestone formations (only rarely you see traces of snails/shellfish in the caves) for reasons which I do not know. Black chert is common in the limestone and you will often see large bands of it cutting through. Also, numerous erratic boulders are strewn throughout the area due to it being a major glacial spillway. It really is an awesome place! Bfesser, those dendritic samples you have look sweet! My cousin used to work at the phosphate mine in Central Florida. He had a huge hand-sized shark tooth from there that was as big as the ones you seen in museums. I'm not a big rock collector, but I thought I'd post a picture of a cool (in my opinion) rock. Here is a rock that I found in my creek. Kind of an interesting dendrite-like effect. I found this curious rock out in the garage among some old sea shells and shark's teeth and wondered what it might be. One "top" face that I didn't photograph just looks glazed like a meteorite but the sides look like bent lines vaguely like petrified wood, or maybe volcanic goings-on. A strong neodymium magnet will not lift it but it's magnetic and heavy. 1-2 - selenite "blades" or "flowers"
1-3 - possibly a fine hornblende? the lump above I suspect is iron slag? Now I know who to ask if I need a rock identified.